Situated on Ras Om Sid promontory, 15 min. drive from Airport. 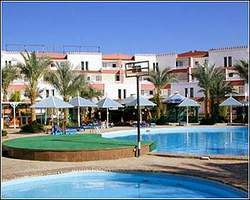 The hotel commands stunning views of Sinai mountains and Ras Mohamed Peninsular. It overlooks the harbor of Sharm El Maya and its private sandy beach accessible by its panorama elevator. Experience all that Sharm El Sheikh sandy beaches and crystal sea have to offer. Explore the exotic reefs, snorkel, windsurf, and other water sports. Unique giant pool (heated in winter) and all day fun with Beach Albatros Resort Sharm El Sheikh animation team as well as other extensive leisure activities. Beach Albatross invites you for its exciting live entertainment programs every evening. The hotel is special for its Kiddies Club building and court, open from 8:00 to 20:00 daily where children have a variety of games and activities to spend a marvelous time. The comfortably furnished rooms overlook the swimming pool, gardens, sea and perfect sunsets. They are equipped with air-condition, mini bar, satellite TV, direct dialing telephone and bathroom with shower and hair dryer. Most of the rooms open onto a balcony or terrace. The bungalows are ideal for families, and feature two separate bedrooms, a reception, a bathroom and a terrace. Serving Egyptian and international specialties, distinguished breakfast buffet from 07.00 to 10.00, lunch buffet from 12.30 to 14.30, and dinner buffet from 19.00 to 21.30, all served with unlimited selection of locally produced alcoholic and non-alcoholic drinks including local beer, wine, soft drinks and water. Enjoy lunch and delicious snacks from 13.00 to 17.00, also serves all kinds of drinks from 10.00 to 17.00. Enjoy stunning sea view and sun set, late breakfast from 10.00 to 12.00, coffee/tea/cake from 15.00 to 18.00, late snacks from 21.30 to 24.00 (upon request), live music from 20.00 to 23.00. There is no shortage of activities at Beach Albatros Resort. You have the choice of peaceful, uninterrupted swimming and sunbathing or lively beach activities with a wide choice of water sports. You can play tennis, beach volley ball, water polo, billiard and table tennis. The fitness center is the perfect place to get your daily workout, enjoy a massage therapy or a relaxing steam bath. The beach of the resort is regarded as one of Sharm El Sheikh's most picturesque spots, where you can not only enjoy breathtaking panoramic views of Ras Mohamed Peninsula or watch the multicolor sunset over the sea and surrounding islands, but experience the spectacular underwater world of the Red Sea. The best snorkeling is right off the hotel beach and for world-class SCUBA diving just down to the beach a few meters. In the evening enjoy the animation show and entertainment programs. Children can have fun in the children swimming pool or on the playground, leaving the parents free to relax. They can partake in a variety of sports and activities that are organized on a daily basis: sport activities, competitions and performances that the children star in. Beach Albatros Resort Sharm invites you to do as much or as little as you like to make your stay the perfect vacation experience.